When Julie Chu began her whirlwind of a hockey season this past September, as both head coach of the Concordia Stingers women’s hockey program and defender for Les Canadiennes of the Canadian Women’s Hockey League, she could never have envisioned winning two playoff series in one single weekend. Her day began with Concordia as they looked to eliminate the Université de Montréal Carabins in their best-of-three Réseau du sport étudiant du Québec semi-final series. After a thrilling 6-2 win Thursday night on the road, the Stingers knew a home win against the defending U Sports champions would mean a spot in the finals. The team responded with a 3-2 win in a game marked by highs, lows and much dramatics. Chu still had the game on her mind some five hours after the horn had sounded. Chu credited the resiliency of her team and their perseverance through adversity throughout the pivotal game. She also heaped high praise on Stingers offensive star Claudia Dubois, who scored two goals including the game winner on Saturday, as well as netminder Katherine Purchase, for their strong play and leadership. Caroline Ouellette, who was behind the bench as part of the Stingers coaching staff, deflected the praise rather onto Chu for her hard work. “I’m at the point in my life where my primary commitment is to Concordia. They’re my job and the ones I am focusing on. It’s a big deal to win an RSEQ championship.” — Julie Chu. The wins against the Carabins, who had won the national title last season, marked the first time since 2006 that the Stingers women’s hockey team had won a playoff game. The Stingers are getting set to battle the McGill Martlets in the RSEQ finals next weekend. Regardless of the outcome in this three-game series, the Stingers are guaranteed a spot in the U Sports Women’s Hockey Championships beginning March 16th in Napanee, Ontario. Thanks to Montreal’s championship win last year, the RSEQ has earned two berths into the tournament. It will be the Stingers first appearance at the event since the 2004-2005 season. 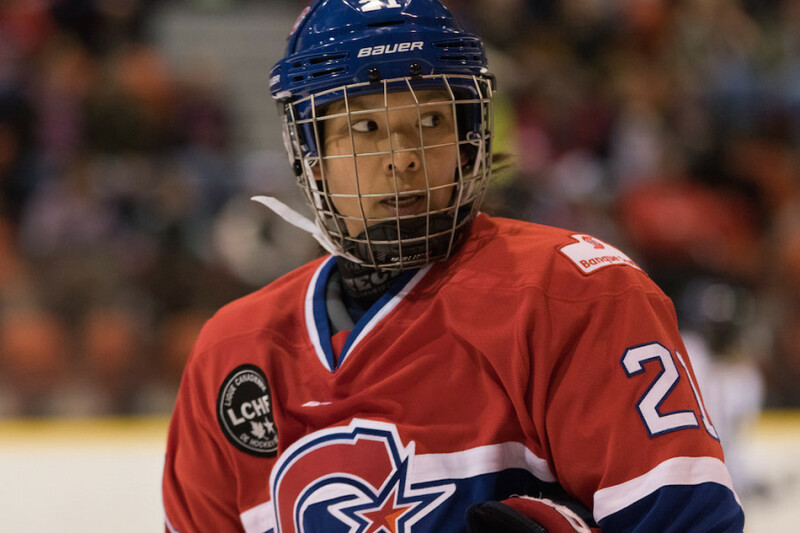 Once the game wrapped up just before 4:00 p.m at the Ed Meagher Arena, Chu quickly made her way to the Bell Sports Complex in Brossard, ahead of a 5:45 p.m puck drop in game two of the Clarkson Cup semi-final playoff series against the Brampton Thunder. Unlike during a similar situation faced with last season, she made it well in advance of puck-drop. Chu was coaching the Stingers at Concordia while Les Canadiennes were facing off with the Toronto Furies in their semi-final playoff series in Brossard. Chu made it to the arena midway through the first period and would later collect three points in the win. She remembered dressing in the backseat of her father’s car on her way to the arena. Chu was thankful she did not have to rush this time around. On this day, Chu and Les Canadiennes would beat the Thunder 5-1 and advance to the Clarkson Cup final, a feat Chu relished in after the game. It is still unsure, however, whether or not Chu will indeed play in the Clarkson Cup final next Sunday in Ottawa. The potential third game of the RSEQ finals will be played on that same day in the Montreal area. As she has done all season, Chu vowed to be by her Stingers’ side. She admitted that such a decision would be “one of those really tough life choices”, but will nevertheless show her support and love towards Les Canadiennes in the eventuality she cannot play. Chu is grateful of the support she receives from the Stingers coaching staff, Canadiennes organization and her loved ones. Her father Wah flew in early Saturday from the United States to be with his daughter during both critical playoff games. Chu called her father “a road warrior”, given that he had just returned home Friday from a week-long trip to Europe before jet setting to Montreal. Correction: The photo credit read Louis-Philippe Dumais, it should have read Louis-Charles Dumais. The Link regrets the error.